Renewable energy (RE) can play a critical role in sustainable development in Africa. We conducted a focused literature review on articles discussing the conditions of deployment of renewable energy resources in Africa, with the goal to understand the latest research trends, questions and issues on this topic. Our search period is limited to 2013–early 2018. The review did not attempt to provide an exhaustive analysis but rather to provide a snapshot of pertinent questions to distil specific issues. The thematic analysis of the literature revealed the following trends: the success of RE in the region has been limited by a combination of factors which include poor institutional framework and infrastructure, high initial capital costs, weak dissemination strategies, lack of skilled manpower, poor baseline information and weak maintenance service. Future solutions to deploy RE in Africa and bridge the financing gap will require renewed efforts in current approaches as well as new approaches. International Energy Agency. International Renewable Energy Agency, United Nations, World Bank Group, World Health Organization. 2018. Tracking SDG7: The Energy Progress Report 2018. World Bank. Washington, DC: World Bank. https://openknowledge.worldbank.org/handle/10986/29812. License: CC BY 3.0 IGO. Accessed 21 Jul 2018. IEA: International energy agency. World energy outlook 2016, Paris, France. 2016. Available at: https://www.iea.org/publications/freepublications/publication/WorldEnergyOutlook2016ExecutiveSummaryEnglish.pdf. Accessed 21 Jul 2018. IEA-ETSAP, & IRENA International Energy Agency—Energy Technology Systems Analysis Programme & International Renewable Energy Agency (2015) Hydropower. (Technology Brief E06). Retrieved from http://www.irena.org/DocumentDownloads/Publications/IRENAETSAP_Tech_Brief_E06_Hydropower.pdf. Accessed 04 Aug 2018. ESI Africa. Evaluating Africa’s small hydropower potential. 2017. [Online] Available at: https://www.esi-africa.com/evaluating-africas-small-hydropower-potential/. Accessed 04 Aug 2018. •• IRENA. Renewable power generation costs in 2014. International Renewable Energy Agency. 2014b. http://www.irena.org/DocumentDownloads/Publications/IRENA_RE_Power_Costs_2014_report.pdf. 2015. 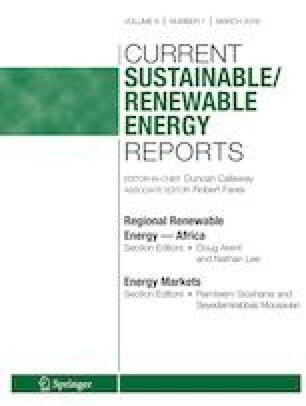 A detailed study and data on the costs of renewable electricity production in Africa. Accessed 11 Aug 2018. EUEI PDF, EnDev and Practical Action. National electrification approaches—review of options. 2018. endev.info/content/File:National_Approaches_to_Electrification_-_Review_of_Options.zip. Accessed 11 Aug 2018. Bensah EC, Kemausuor F, Antwi E, Ahiekpor J. China-Ghana South-South Cooperation on renewable energy technology transfer. 2014. Available from: http://www.gh.undp.org/content/dam/ghana/docs/Doc/Susdev/UNDP_GH_SUSDEV_C-G_Identificationofbarrierstorenewableenergytechnologytransfer.pdf. Schmidt T. Low-carbon investment risks and de-risking. Nat Clim Chang. 2014;4(4). Available from: https://www.researchgate.net/publication/262951744_Low-carbon_investment_risks_and_de-risking. Accessed 5 July 2018.